At Meadowvale Dental Centre, our dentists understand how a straight smile can impact one's self-confidence. For those in need of orthodontic treatment for minor to moderate misalignment issues but fear their self-esteem will be impacted, our Mississauga practice offers Invisalign® clear aligners. Our dentists highly recommend this discreet teeth straightening method for both teens and adults. To learn more about clear braces and how they can help you achieve a healthy smile, contact our practice today! Convenience: With traditional metal braces there are dietary restrictions placed on patients to maintain the appliance. Invisalign clear aligners are removable, so you never have to avoid your favorite foods. Activities such as eating, drinking, and brushing your teeth are made easier. Patients do not have to maintain the braces with special tools, nor do they have to change their normal hygiene routine. Discreet Appearance: Many patients do not wish to have bulky, metal brackets and wires in their smile. 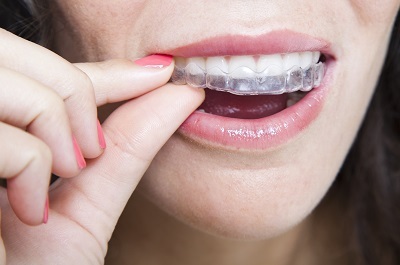 Invisalign trays are made out of a translucent, medical-grade plastic. As the clear braces subtly shift teeth into alignment, friends and peers may not realize that you are undergoing orthodontic work. Our dentists and staff at Meadowvale Dental Centre prepare you for treatment with an in-depth consultation and examination to determine if Invisalign clear aligners are the right treatment for you. To ensure your whole smile is maintained, we treat any signs of tooth decay or periodontal disease before Invisalign treatment begins. Our Mississauga Invisalign providers take impressions of your smile and fabricate the clear aligner trays to the unique contours of your teeth so that your clear braces fit comfortably during each stage of treatment. After sending your molds to Invisalign, we receive your aligner trays and projected results for every step of the regimen. This way you always know how your teeth should look and there are no surprises once treatment is finished. Enhance Your Oral Health with An Aligned Bite – Contact our Practice Today! A straight smile is not only aesthetically pleasing but ensures a healthy bite and comfortable jaw function. At Meadowvale Dental Centre, we provide Invisalign clear aligners as an option for patients looking for a discreet way to straighten their teeth. For more information on Invisalign or to schedule a consultation, contact our practice today!